The pace of business continues to accelerate, with customers expecting new and better application services delivered quickly. To remain competitive, businesses need to fast-track innovation and respond quickly to opportunities. 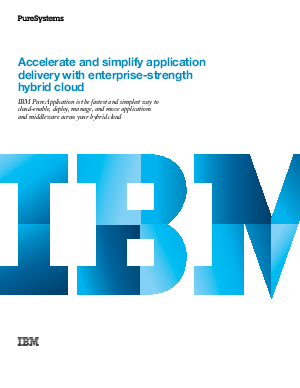 IBM® PureApplication® enables your organization to easily exploit cloud capabilities to develop and deliver applications up to 20 to 30 times faster. IBM PureApplication is a hybrid cloud application platform for deploying applications and middleware quickly and repeatedly, with enterprise-grade services. Whether on-premises or off-premises, IBM PureApplication makes it simple and fast to deploy your applications for the first time or move them from one environment to another. For example, you can deploy an application on-premises and then move it onto a cloud off-premises, or vice versa, without changing the application. It’s as easy as a few clicks to move and deploy your application configuration and provision virtual system resources, due to the use of patterns.